Bonus CD-ROM included! The CD-ROM contains the entire Wonders of Old book in digital format so that you can print out multiple copies for additional children or extra pages to insert into your book should you run out of room on a page (doesn't happen too often!). The CD-ROM also includes timeline category stickers that can be printed on full size sticker sheets to place within the pages of the book. 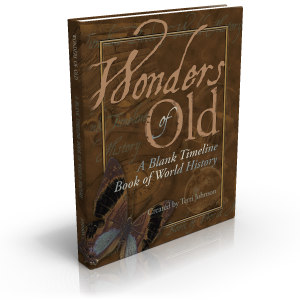 If you choose to download your Wonders of Old book, take a moment to save or print the printing instructions provided for you here. (Printing instructions are available on the CD-ROM).